Karen and Frieda have been enjoying canicross for a couple of years but like most people who discover this sport there is more to it than simply off-road running! 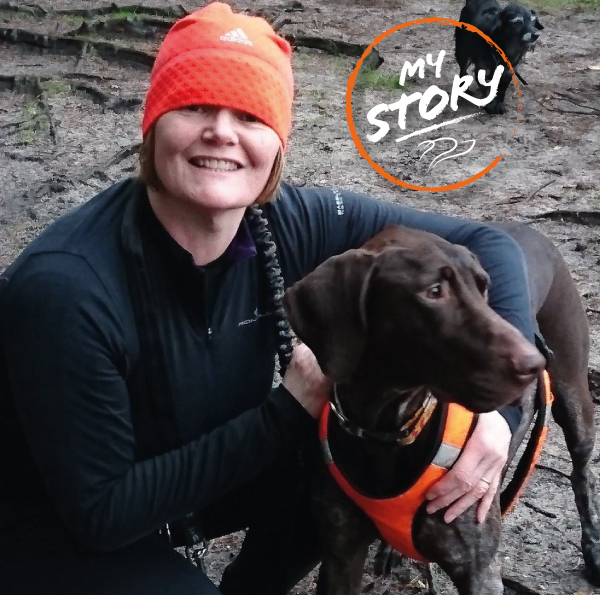 Karen tells us how, through canicross, she has made some special and lasting friendships. But above all, canicross has had a massive impact on her health and lifestyle…all for the better of course! How did you first discover canicross and what appealed to you about giving it a go? I wanted to get fit and lose weight having had a health scare that necessitated me to change my lifestyle. 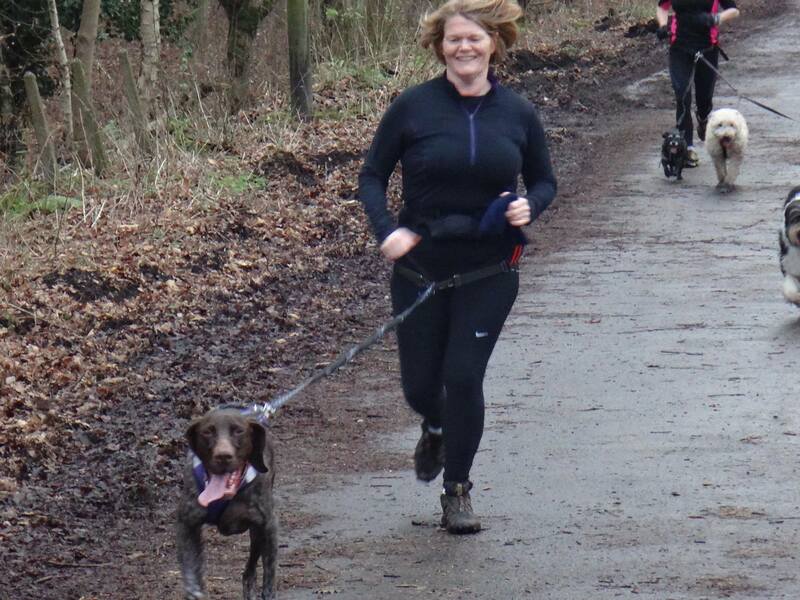 So I started to run with a group of friends and after a while they told me about a relatively new sport called canicross….sounds interesting, so as my dog Frieda was over 12 months old I thought I would give it a go as it would enable me to get fit and exercise my dog at the same time! Frieda is a 2.5 year old German Shorthaired Pointer (GSP). They are Hunting Pointing Retrieving (HPR) and are members of the Gundog group as defined by the kennel club. They are a very biddable, high energy and intelligent breed that require at least 1-2 hours exercise per day. In the winter in addition to canicross, Frieda and I work as part of the beating team at a local shoot, which allows her to do her HPR stuff and I get more exercise!!! Amazing to watch her body language change when she indicates a scent!! 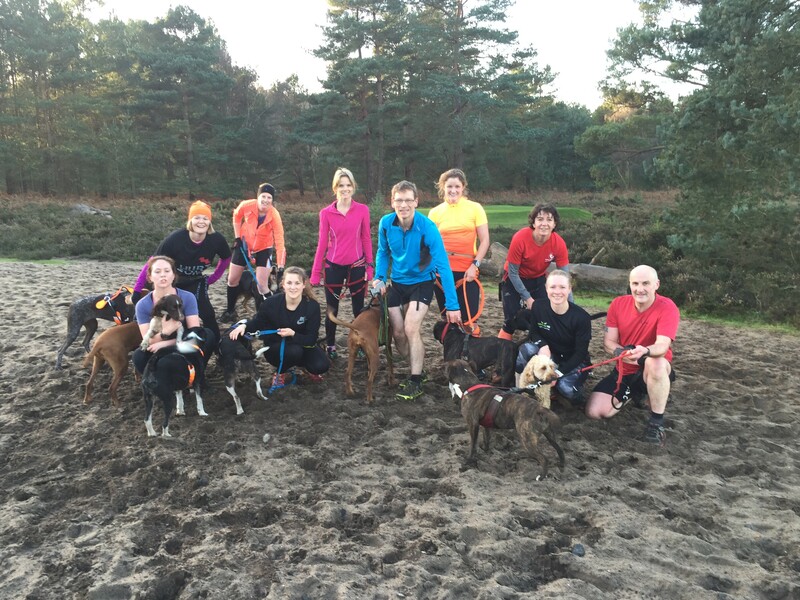 How did you & Frieda get along on your first ever canicross run? Was she a natural or did she need some encouragement? Our first time doing canicross was hilarious as she is so powerful. I couldn’t stop laughing! She took to it so quickly. I am told German Pointers are one of the best dogs to use for canicross and I can vouch for that!! What do you love most about canicross? I love canicross because it has introduced me to a fantastic (growing sport). I have met such wonderful people and their dogs, of all shapes and sizes (the dogs that is!!!). It is so inclusive for people of all ages and our social group organise different runs to cater for all standard of runner. No one gets left behind! How has it benefitted you personally? What difference has it made to your health and well-being? I have lost 2 stones in weight and my health has significantly improved which has pleased my Doctor! However, my bond and communication with Frieda is so much stronger – we are a true partnership. As a direct result of canicross I can cope with the stresses of work and running a busy household. How does running with Frieda compare to running dog-less? Running with Frieda is unbelievable and she is 30 kgs of pure pulling power. When I run without her I feel sluggish and I am at least 2 minutes slower per mile! Where do you tend to go canicrossing and what distances do you cover? As a veteran member of the North Downs Canicrossers, I generally run between 6 and 8 miles and I am so lucky to live in NE Hampshire as there are so many areas I can run either on MOD land or across the North Downs area of Surrey, which is perfect terrain for canicrossers!! Have you done many canicross races? How do they differ from your normal social runs? I have competed in a number of Brutal 10km races which welcomes canicrossers but I am more of a social runner which is great as our social group caters for all who run. What would you say to someone thinking about giving canicross a go? I would thoroughly recommend taking up canicross. It is the most hilarious fun and social way to exercise yourself and your dog ! !